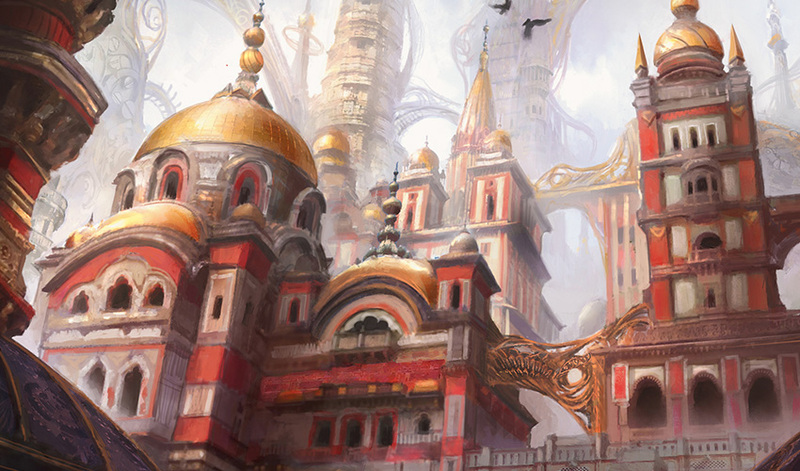 Today we're bringing you more about the world, history, and denizens of Kaladesh. You can also find this information in the Kaladesh Player's Guide, and stay tuned for even more story and art in The Art of Magic: The Gathering—Kaladesh, available in January. 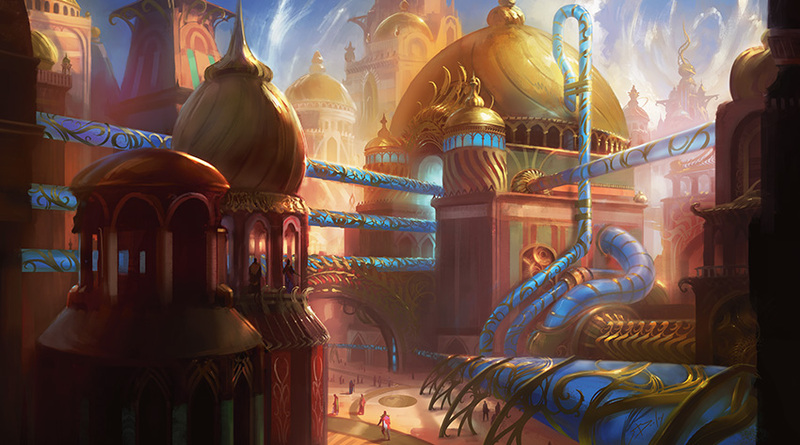 The world of Kaladesh is a living work of art. 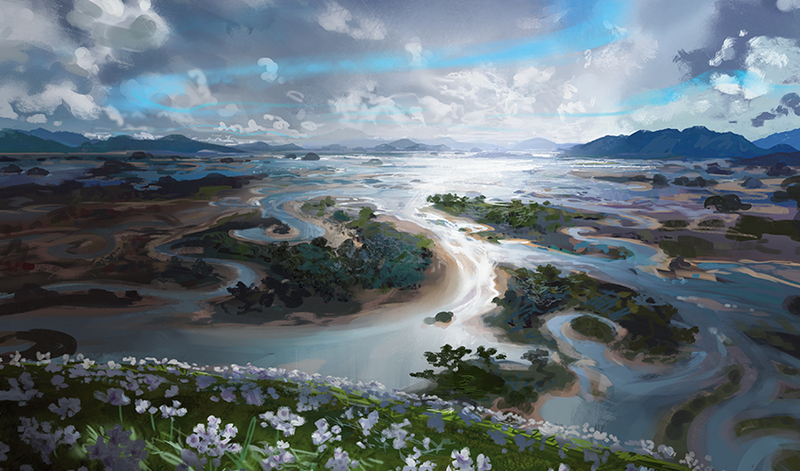 From the vibrant skies to the twisting trees to the creatures themselves that thrum with power, Kaladesh owes its bright existence to the presence of a mystical blue substance known as aether. 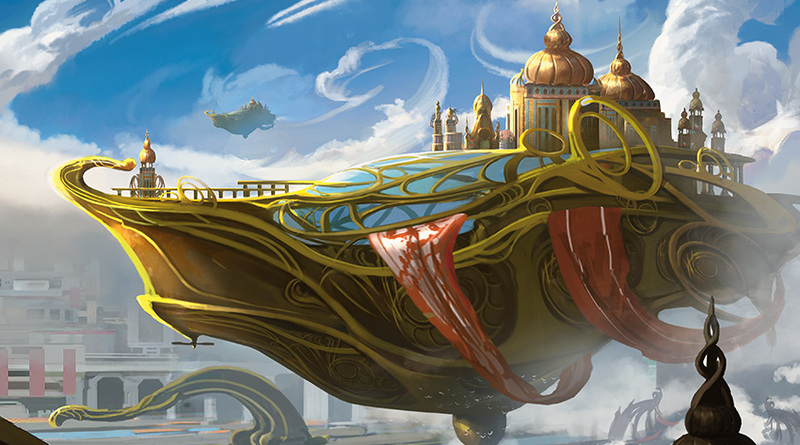 Aether is present on planes throughout the Multiverse, but on Kaladesh it has a more tangible presence: it can be seen, touched, and even devoured. Most aether on Kaladesh exists in its raw form high in the upper reaches of the aethersphere. Under the right conditions, the brilliant blue substance makes its way down to the world below. When touched by aether, nature reacts. Trunks of trees form horizontal spirals to leach as much power as possible from the gusting winds. Flowers bloom in bucket-shaped blossoms to collect falling aether rain. Mountains are pockmarked with dazzling, luminescent aether gems pounded into their sides by the squalls. And waterways carve paths through the land to reflect the seasonal ebb and flow of aether tides in the skies above. The wildlife of Kaladesh is affected too, attracted by the magnetic pull of aether. Flocks of birds migrate with it, schools of fish swarm around it, wild beasts battle over the richest deposits, and gremlins consume condensed, nonreactive aether geodes. 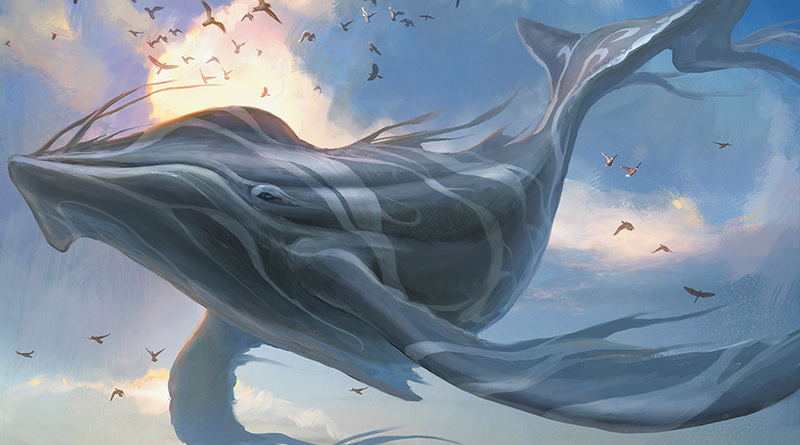 Creatures such as skywhales, drakes, and high-flying birds have evolved to live in the volatile, energy-rich aethersphere itself, spending their lives basking in its radiance and amassing its magical power. 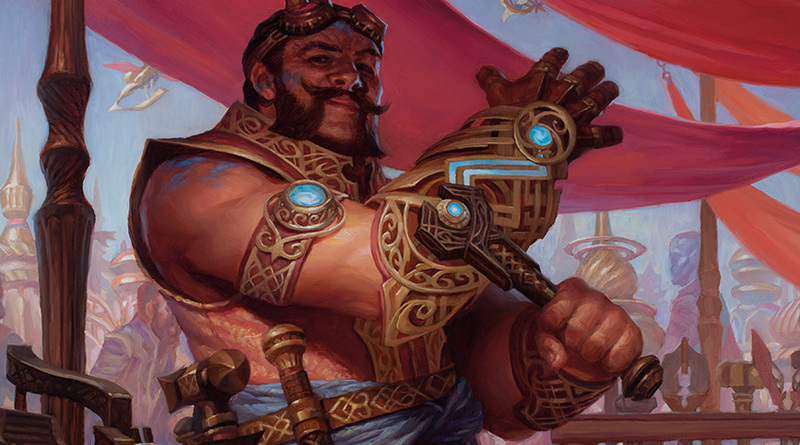 It was always clear to the people of Kaladesh that aether was powerful, but only in the past century have they found reliable ways to collect and use that power. Six decades ago, the world-renowned aetherologist Avaati Vya cracked the aether code. The refinement process she developed separates the charged, energy-rich component of aether from its volatile, reactive component. This allows people to harness the power of aether without risking life and limb. 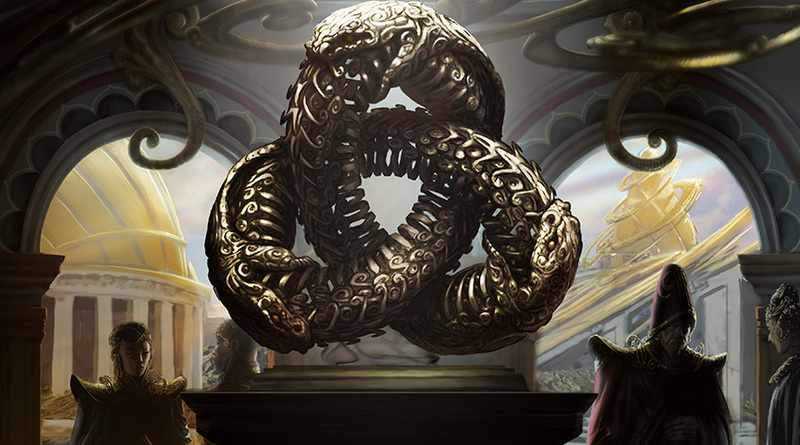 Mere months after Avaati Vya's first successful refinement, Kaladesh's largest governing organization, known as the Consulate, saw the opportunity to ensure that the power of aether was made accessible to all. The Consulate developed methods for mass production and distribution of refined aether. Safe collection techniques were established, airships were commissioned for transportation, and aether pipelines were constructed to carry the refined energy directly to homes. Much to the pleasure of the consuls, the plane-wide availability of aether spurred what has come to be known as the Great Aether Boom. 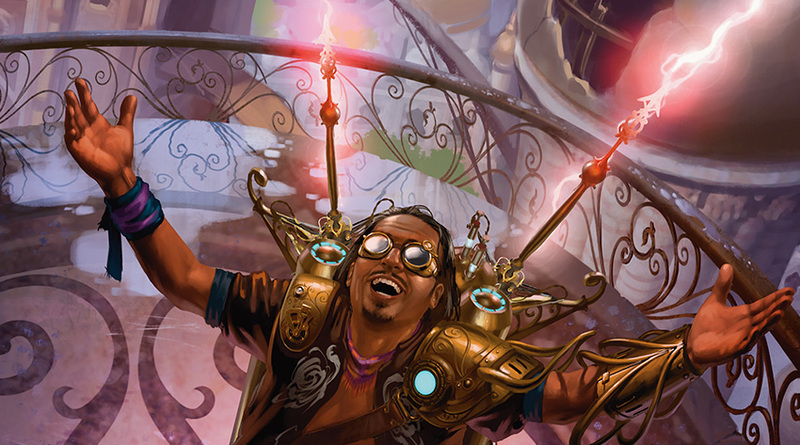 The people of Kaladesh, many of whom were inventors and craftspeople, now had access to power beyond their dreams. It was a time of frenzied invention, boundless hope, and wondrous celebration. Today, the Consulate continues to encourage the optimistic and creative environment that the Great Aether Boom helped to foster. 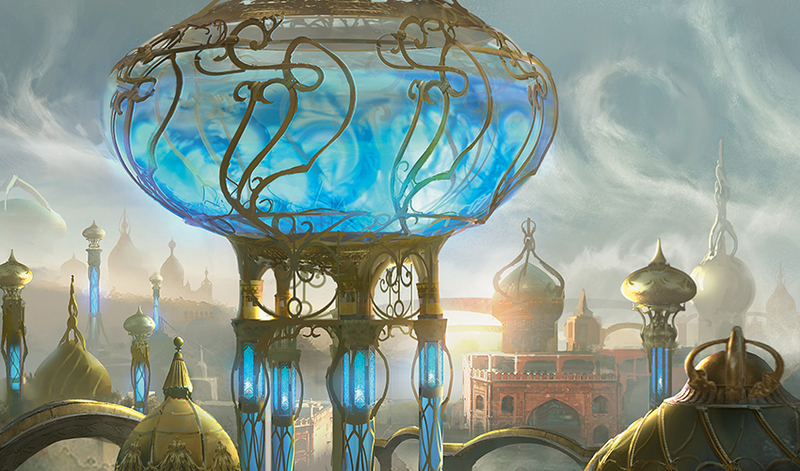 Kaladesh is a world where anything is possible, everything is buildable, and any problem can be solved by the power of mystical aether. But even on the seemingly perfect world of Kaladesh, there are those who are dissatisfied. A faction known as the renegades believes that the Consulate is concealing information and innovation from the public. They think that by enacting safety regulations and aether distribution quotas, the Consulate is infringing on their freedoms. And they see the centralized authority of the Consulate as a tool for oppression. These renegades defy the Consulate as they attempt to restore the independence they believe they deserve. 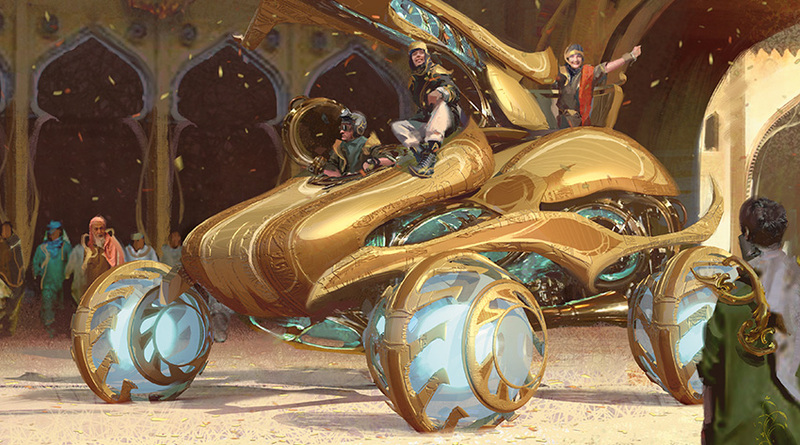 Since the Great Aether Boom began, artisans, engineers, and architects on Kaladesh have been on a ceaseless spree of invention. This has led to a world where cogwork automatons walk the streets, ornate whirling thopters flit over the marketplaces, animal constructs act as humble companions, and dramatic airships soar through the highest reaches of the aethersphere. Each of these inventions is the product of an innate five-stage process of invention called the Aether Cycle. Inspire—Artisans observe patterns in nature shaped by aether and find the inspiration for a new device. Innovate—Brilliant inventors hone and refine the design of that device and carry it to ingenious new heights. Build—After the design is complete, hardworking manufacturers build the device, infuse it with aether, and repair and maintain it throughout its lifetime. Liberate—When a device has reached the end of its usefulness, it's dismantled, and the distilled aether inside is liberated from the invention. Reclaim—Finally, the aether recombines with the secondary product of refinement, and it returns to the aethersphere. 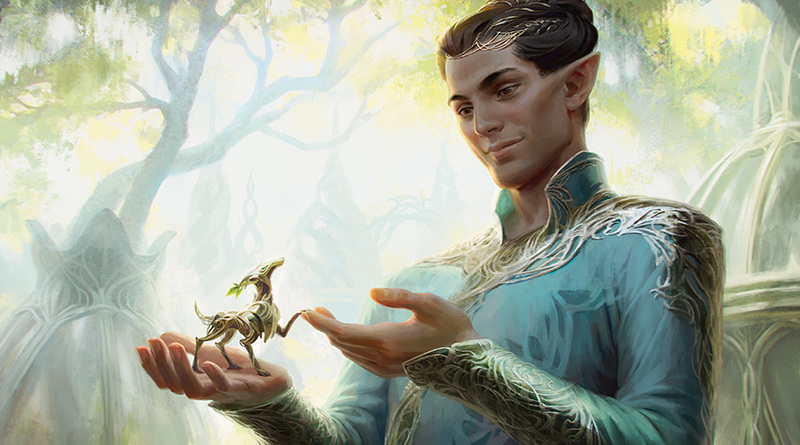 The elves of Kaladesh live in harmony with both nature and technology because they believe that nature inspires technology. In their eyes, each artifact is an expression of natural laws and principles. They are able to inspire others to see this as well, and thus they have become associated with the "inspire" step of the Aether Cycle. They most often supply the essential spark of an idea. Vedalken believe that nothing is perfect, and nothing can ever be perfect—and they rejoice in this. Vedalken see every imperfection as a chance for improvement. They spend countless hours in the pursuit of progress, and thus they are associated with the "innovate" step of the Aether Cycle. They represent the genius brainstorm, the next idea just beyond what's currently possible, and the clever trick that solves the engineering puzzle. For dwarves, there is nothing more worthy of praise than a machine that has stood the test of time. Dwarves are proud of their quality creations, and often speak of them as though they were their children. Dwarves are Kaladesh's tireless workers, and they personify the "build" aspect of the Aether Cycle. They are sticklers for craftsmanship, valuing the durability of a machine over its innovation. Gremlins are tenacious scavengers with an insatiable appetite for aether. They congregate wherever aether is plentiful, and they stop at nothing to break into supplies of the glowing, blue substance and feed. As a side effect of their extremely messy feeding, much of the aether is liberated back into the environment. Thus gremlins embody the "liberate" step of the Aether Cycle. Their crucial role is often undervalued by the former owners of their meals. 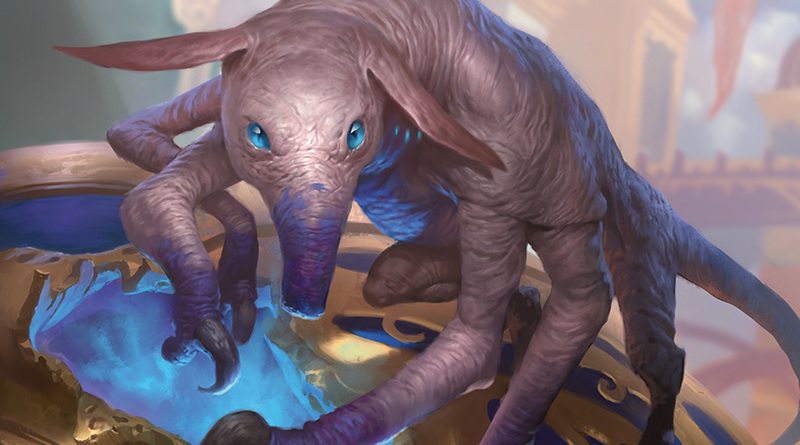 Aetherborn are connected to aether in a more intimate manner than any other race on Kaladesh: they are born of it, an unforeseen byproduct of the aether refinement process. Aetherborn are in a constant state of flux, always moving toward a form that can be recycled back into the aethersphere. The "reclaim" step of the Aether Cycle takes place inside an aetherborn's body. It's not a long process. An aetherborn's life span can range from a few months to a few years, and it is the fleeting nature of their existence that defines them. Each moment not spent indulging in fun or pleasure is considered a waste. They enjoy life with a contagious exuberance. 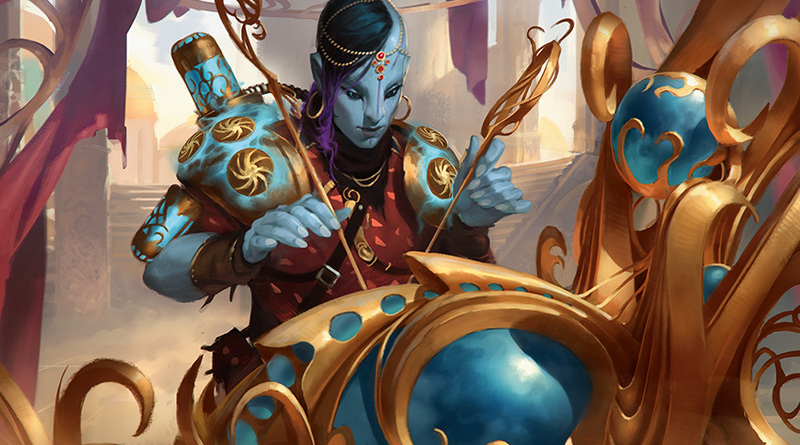 While humans are not innately connected to aether like other Kaladeshi races, they are credited with being among the first to consider the various properties of aether as a cycle. They see the big picture, while other races get caught up in the details. At their best, humans attempt grand and expansive endeavors and become energized by seemingly impossible goals. 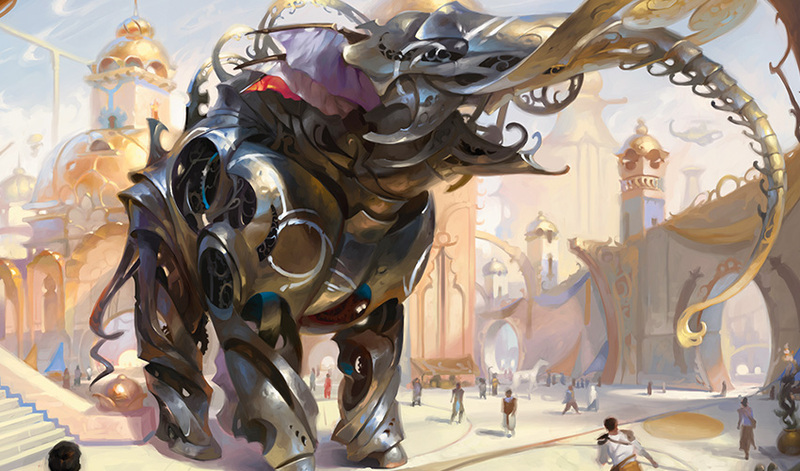 Over the course of the last half century, hundreds of thousands of new devices have been invented on Kaladesh. Now, the Consulate has deemed that it's time for the greatest inventions to take center stage. It's time for famous and infamous inventors alike to race, battle, and boast their way to the top. It's time for the Inventors' Fair! 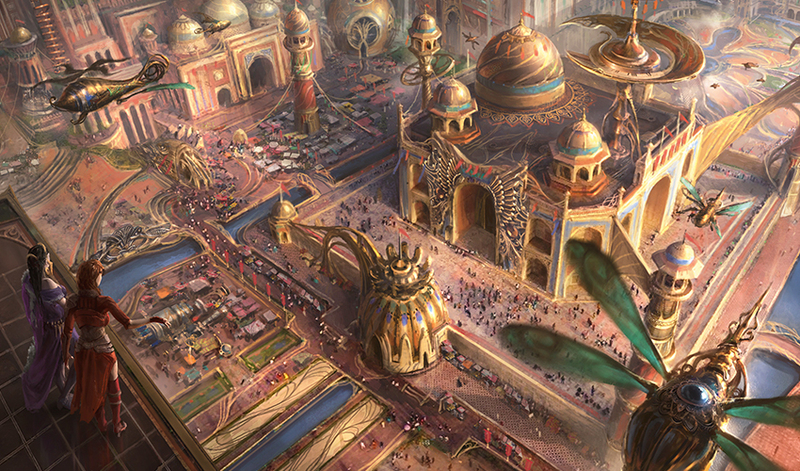 For a full month, the fairgrounds will span the whole of downtown Ghirapur, the largest city on Kaladesh. Inventors' booths will line the streets, arenas will host all manner of matches and races, and the most genius minds of the time will take to the stages. The Fair will have it all: airship races, brilliant new construct accessories, the latest transports, and inventing competitions called "demonstrations." An invitation has been extended to all denizens of Kaladesh. There are over a hundred categories for inventors to enter, but there are five major categories that will award the biggest prizes at the Fair. Airships, skyspeeders, freighters, dragsters, barges, cruisers, and even caravans will be entered in the Vehicles category. Vehicles will be judged on the novelty of their designs as well as their performance on the track. Races will be the main events at the largest arenas, and tickets have been sold out for months. Many of the submitted inventions for the Architecture category will be the buildings, arenas, and stages of the Inventors' Fair itself. Architects will be honored when their arenas are chosen for the finals of races, their stages for the most popular demonstrations, and their hotels for the most famous judges and dignitaries. Perhaps the category that has received the most attention from the Consulate is Aether Science. 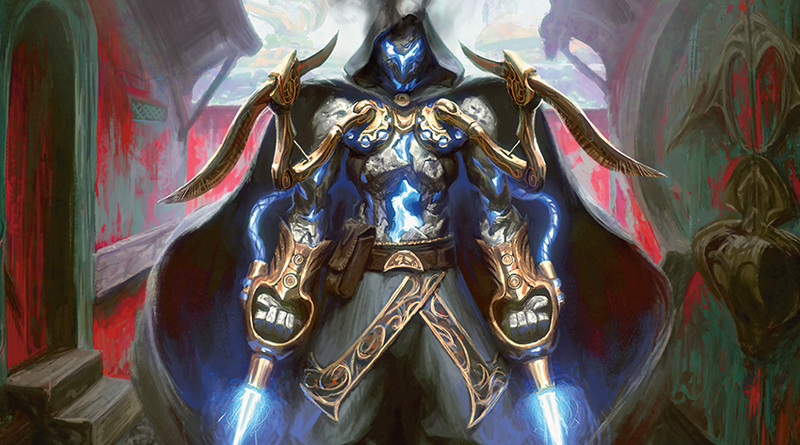 Head Judge Tezzeret himself has put out the call for any and all theoretical breakthroughs in the areas of New Refinement Methods, Enhanced Power Extraction Techniques, and Alternate Means of Matter Transportation (Teleportation). Staged demonstrations of these inventions and theories promise to be interesting—and not entirely academic. Carefully supervised weapon demonstrations will be open to the public, wherein weapons' performance will be rated and judged by Consulate professionals. There are multiple categories, including Long-Range, Personal Defense, Aether-Firing, Vehicle-Attachment, and Construct-Attachment. Though it may not be the most practical of categories, the Animal Construct category promises to be among the most popular. Fans of every age will flock to the massive, interactive habitat to observe the constructs as they perform feats of agility, speed, and strength to win top prizes. Inventor societies are a cornerstone of life on Kaladesh. From secret backyard clubs to multi-chapter organizations that have dozens of members, they are formed by like-minded inventors who help each other on their quests to create. And they'll all be represented at the Fair. The League of Aeronauts is the first, and most esteemed, aeronaut society in Ghirapur. While there is a certain degree of kinship among all aeronauts, the League's rituals and traditions set them apart from other societies, and membership is by invitation only. All League members wear green coats embroidered in orange and adorned with the badge of the ten-bladed propeller. "The Crows will show" is the unofficial motto of a small but notorious aeronaut society that never misses a chance to compete in a sky derby. The Derby Crows have only a handful of members and only three airships between them. Nevertheless, they are regarded as some of the most talented pilots in Ghirapur. One of several societies that create wearable artifice, the Glint-Sleeves have made a name for themselves by focusing on devices that fit over the wearer's arms and hands. The Glint-Sleeves are mostly gearcrafters and foundry workers who share a passion for building custom pieces designed to solve a particular challenge. The Scrappers gather for one reason only: to pit their fighting automatons against each other. Though they're a little rough around the edges, the Scrappers are surprisingly meticulous in their designs, constantly looking to refine and modify their automatons to maximize any advantage. The automatons are treated more like prizefighters than mere machines, and some even gain a degree of celebrity around the city. If a machine requires a loupe and tweezers to build, then the inventors of the Countless Gears are interested. The spirited and enthusiastic members of this society have a deep fascination with micro-scale artifice. To them, compactness is a sign of mastery. 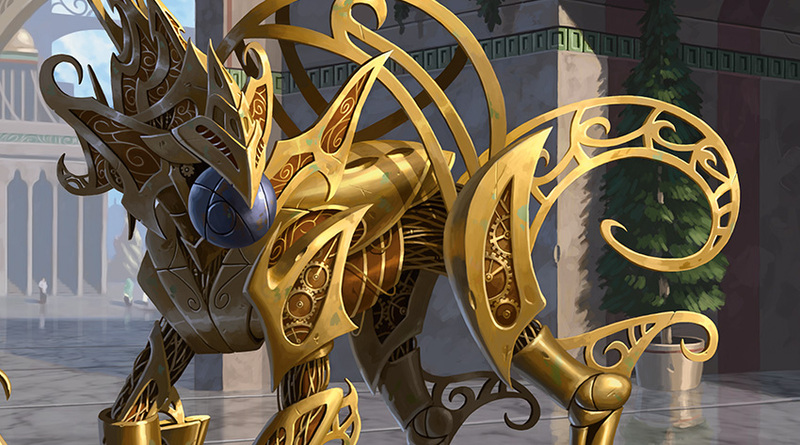 They're responsible for crafting the smallest automatons and thopters found on Kaladesh, along with miniature sculptures that require a magnifying glass to see. One of the many societies founded around the sport of racing, the Ground Grinders tweak and race any vehicle that rolls, crawls, or walks. The society claims a handful of workshops along the perimeter of Ovalchase racetrack in Ghirapur, and it's the most medaled society of its kind. While most Kaladeshi artificers take inspiration from natural forms, some go so far as to try to duplicate the original exactly. The Greenwheel Lifecrafters build automatons that are perfect models of creatures found on the plane—but usually on a massive scale. The constructs move as their wild equivalents do; lumbering rhinos, prancing camels, and trotting horses roam the streets of Ghirapur. The Metalspinners are a temperamental group of artists from the Weldfast zone who specialize in kinetic sculptures and rogue artwork, which they display in the streets. They display their unique works in public as a means to overtly rebel against conformity, using aether to shape metals into massive sculptures that are as functional as they are beautiful. The Metalspinners delight in the beauty and danger of their craft, and they proudly bear the scars of both fire and aether burns. 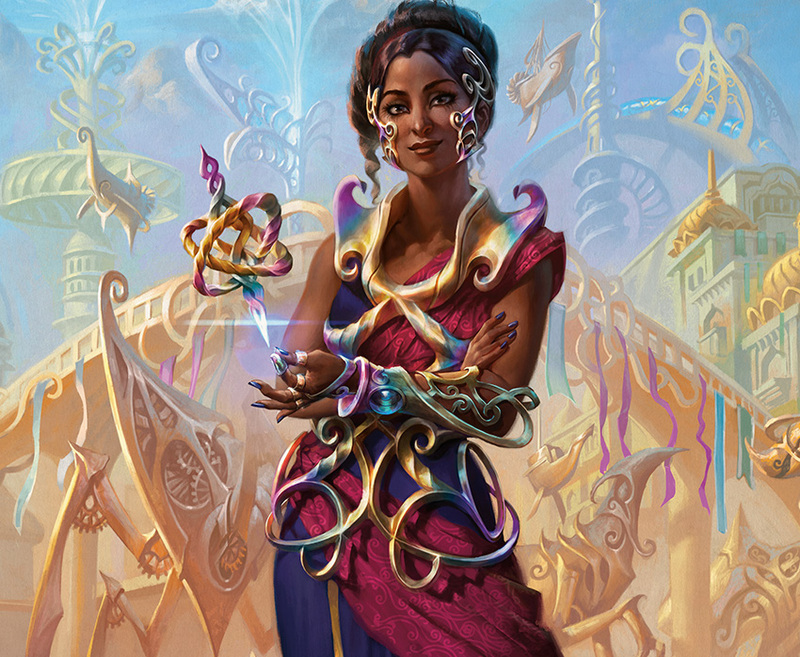 Saheeli Rai is known to the people of Kaladesh as the most brilliant metalsmith of her time. While she is celebrated for her innovation, developing many of her own unique filigreed designs, she is most regarded for her unparalleled ability to create replicas of any creature she sees. Her renown extends well beyond her native city of Ghirapur. Many country-dwelling denizens will be making long treks to the Inventors' Fair just for a chance to see Saheeli's newest creations in person, and perhaps collect an autograph from the famous luminary herself. Saheeli's powers go well beyond what is commonly known. She is a Planeswalker with a powerful magical command over her artifacts, able to compel them to do her bidding. She can also weave seemingly endless threads of metal into formidable, beautiful creations at will. Many of her designs are inspired by creatures she has seen on other planes of the Multiverse. She is smart and quick on her feet with a bright, optimistic personality. 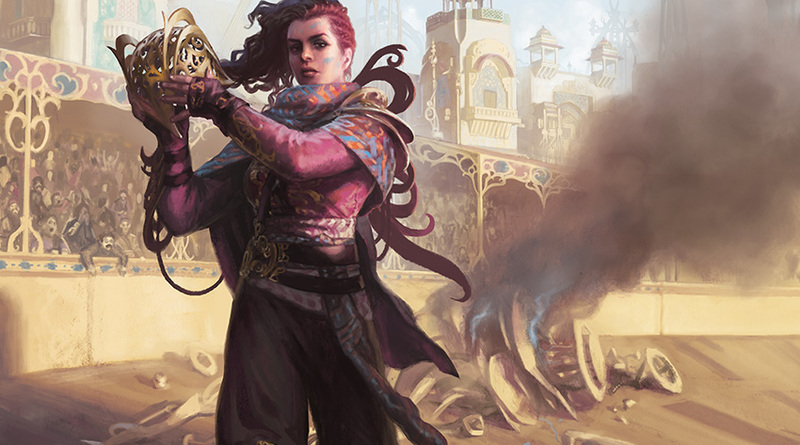 While usually easygoing, Saheeli doesn't hide her competitive spirit, and she has been known to become ferociously cutthroat if anyone on Kaladesh—or anywhere else in the Multiverse—attempts to cross her. Senior Consulate Inspector Dovin Baan possesses the ability to very clearly see every flaw in any system or machine, predicting with startling accuracy how and when a system will fail. But his real power lies in his ability to revise the design and put right its flaws—or at least correct them to the point of near perfection. Dovin subscribes fully to the philosophy that nothing is perfect, and nothing can ever be perfect. But the Consulate is happy to settle for quite close. Under Dovin's watchful eye, injuries caused by Consulate devices have become extremely rare, and there has yet to be a recall on a device he has inspected. His innate ability to keep others safe is why the Consulate has put him in charge of inspection at the Inventors' Fair. Dovin takes his job very seriously. He has identified and mitigated hundreds of hazards affecting the structural integrity of buildings, the designs of presentation platforms, the curvature of racetracks, and the sharpness of ribbon edges. He has even put into place a near-foolproof plan to prevent gremlin infestations. But recently, he has come up against an unexpected threat posed by a self-described renegade. Having exhausted nearly every resource on Kaladesh to counteract the renegade threat, Dovin sees no other choice but to reach outside his world and call on other Planeswalkers who have sworn to protect and defend: the Planeswalkers of the Gatewatch. Chandra Nalaar is a confident, hotheaded pyromancer who defends freedom at any cost. As compassionate as she is courageous, Chandra is driven by her zeal to fight for what she believes in. She gets her rebellious nature and fiery spirit from her parents, whom she believes were killed when she was young. 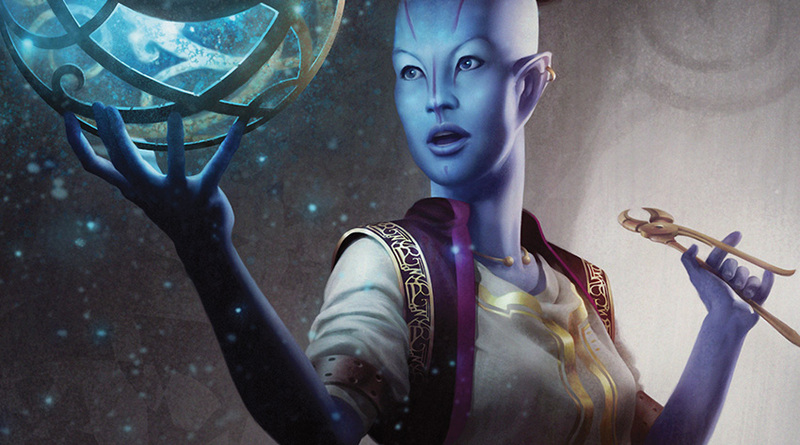 She thinks she would have made them proud when she joined the group of Planeswalkers known as the Gatewatch and took an oath to protect and defend the Multiverse. 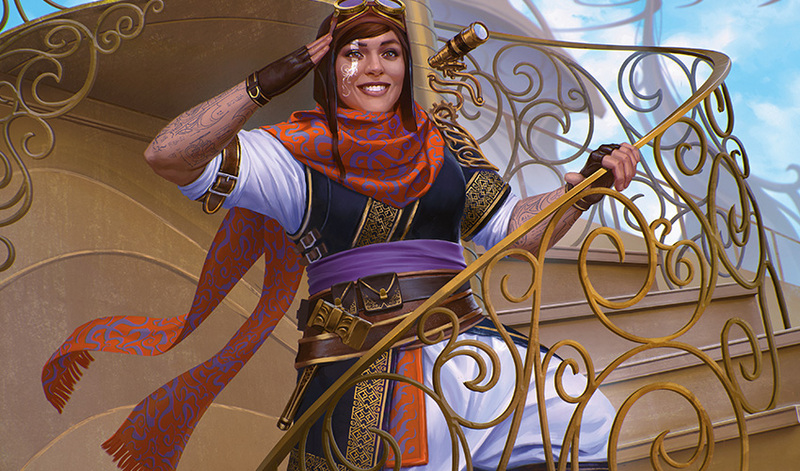 To Chandra, her oath means ensuring that all people on all planes can live free of oppression, something her parents always wanted for those on their home plane of Kaladesh. 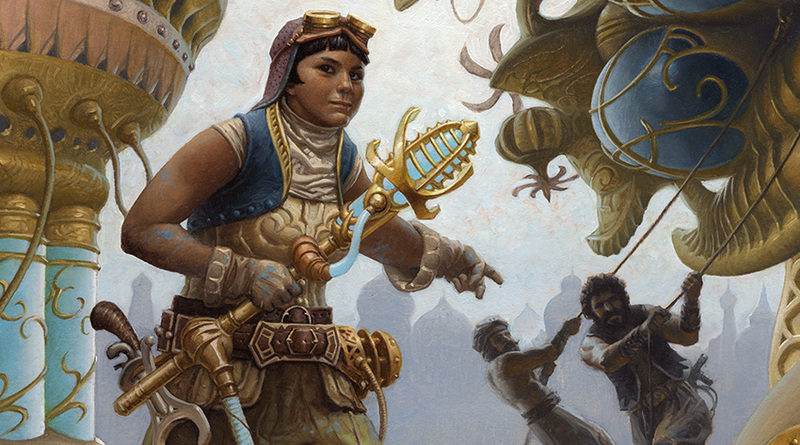 When Chandra hears from the Planeswalker Dovin Baan that the safety of the people of Kaladesh is threatened, she springs to action without a second thought. She returns home for the first time since her parents' deaths. In order to protect the people of Kaladesh, Chandra is willing to face the painful memories of her past. Driven, devoted, and deeply connected to the land, Nissa Revane is a Planeswalker who wields elemental magic. 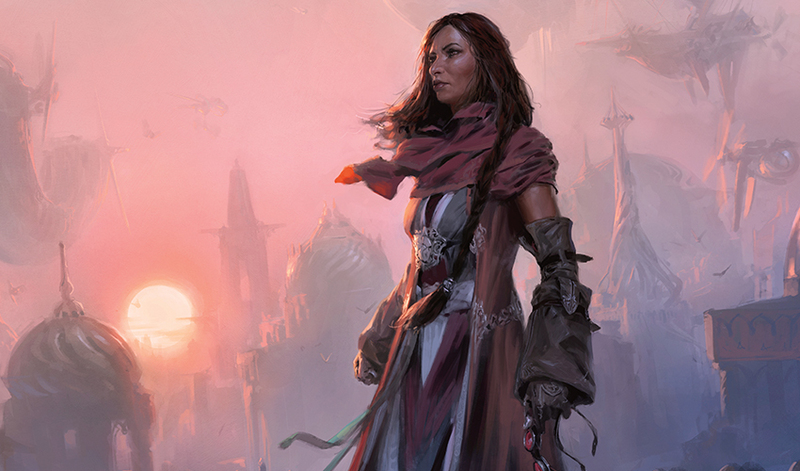 When her home plane of Zendikar was threatened, Nissa felt her world's pain as if it were her own. Her fierce determination to defend her embattled world led her to seek aid from other planes throughout the Multiverse, and the Planeswalkers who joined with her to save Zendikar from the Eldrazi have shown her what can be accomplished when like-minded Planeswalkers work together. Nissa became part of the Gatewatch, taking an oath to protect and defend even the furthest reaches of the Blind Eternities. To Nissa, her oath means standing up for every world and fiercely guarding the life each nurtures. 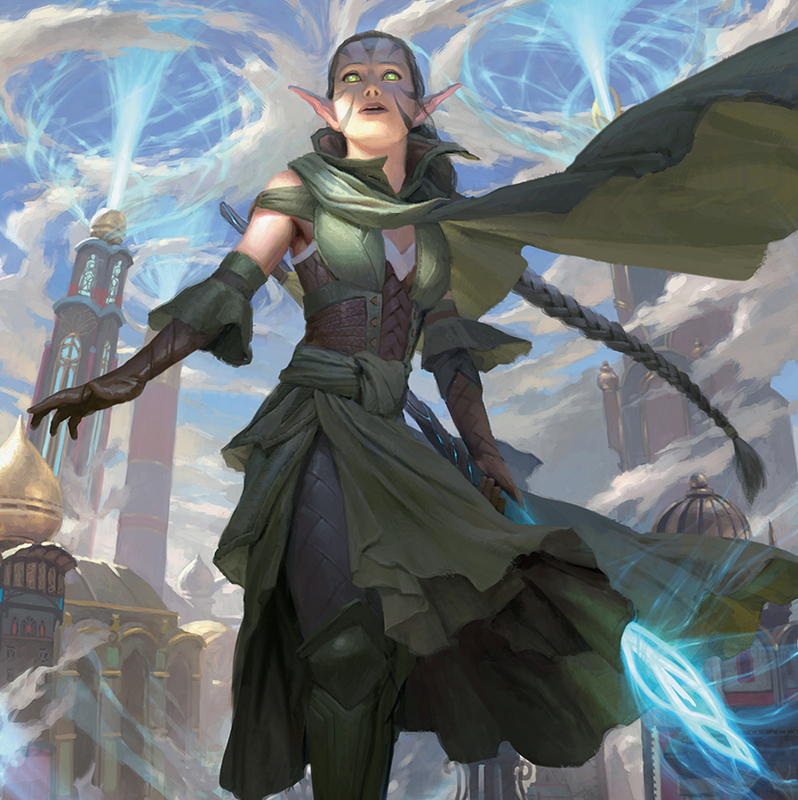 When Nissa's friend and fellow Gatewatch member Chandra Nalaar rushes off to face a threat on her home plane of Kaladesh, Nissa follows to help. Nissa sees this as an opportunity to, in some small way, pay Chandra back for the help Chandra gave Nissa on Zendikar. Nissa hopes she won't let Chandra down. There are many important moments in the Kaladesh story, but the five most crucial—called "Story Spotlights"—are shown on cards. You can read more about these events in the official Magic Story at MTGStory.com. 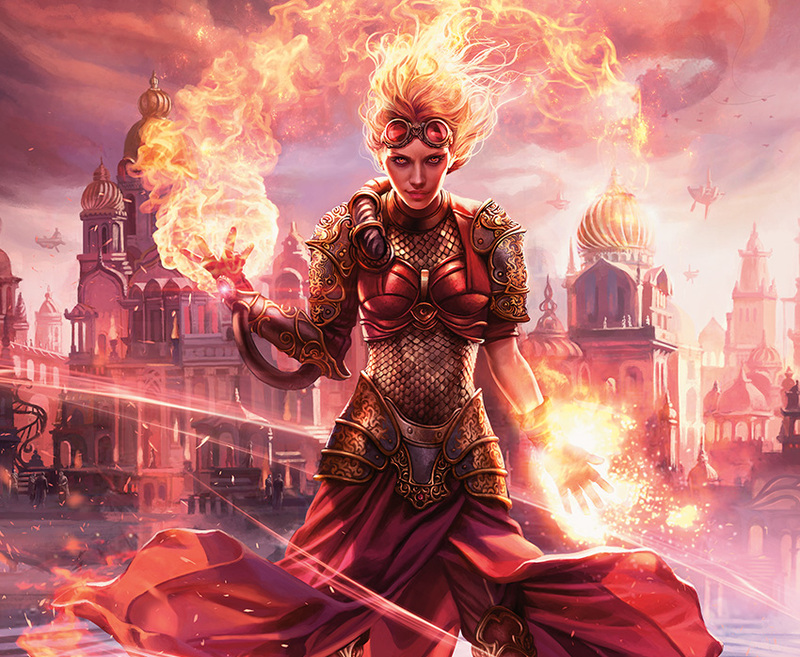 After hearing from the Planeswalker Dovin Baan that there's a threat to the people of Kaladesh, Chandra Nalaar hurries back to her home plane for the first time since her Planeswalker spark ignited. Liliana Vess travels with her, as much for the distraction and the entertainment value as to help Chandra. They arrive in the midst of the sprawling Inventors' Fair, a showcase of innovation and creation. This is where Dovin Baan predicted the renegades would strike, so when Chandra and Liliana see a cloaked figure acting suspicious, they pursue the person through the Fair. Chandra and Liliana confront their quarry, exposing him to be the notorious Planeswalker Tezzeret. 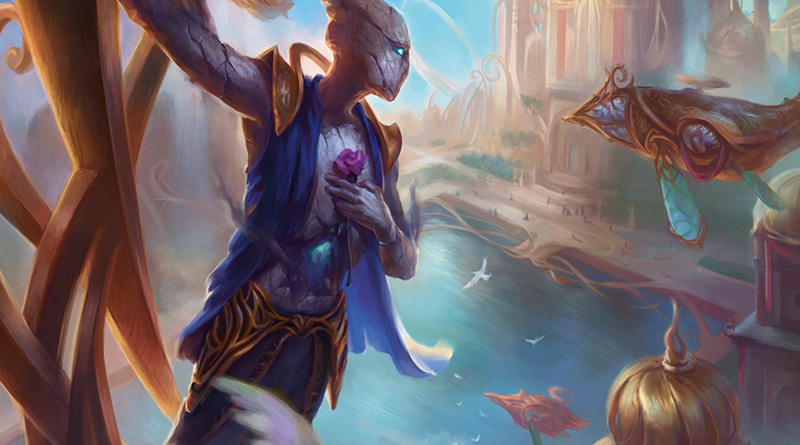 But before they can react, it is revealed that Tezzeret is the head judge of the Fair, and he was actually stalking his own quarry: Pia Nalaar, Chandra's mother! Chandra and Pia are shocked; each believed the other had been killed by the Consulate years ago. But there's no time for a touching reunion. Tezzeret, Dovin, and Consulate enforcers take Pia prisoner, accusing her of leading the renegade threat. Nissa, whose concern for Chandra had led her to Kaladesh, stops Chandra from attacking the Consulate forces in the middle of the Fair. There has to be a better way to rescue Pia. 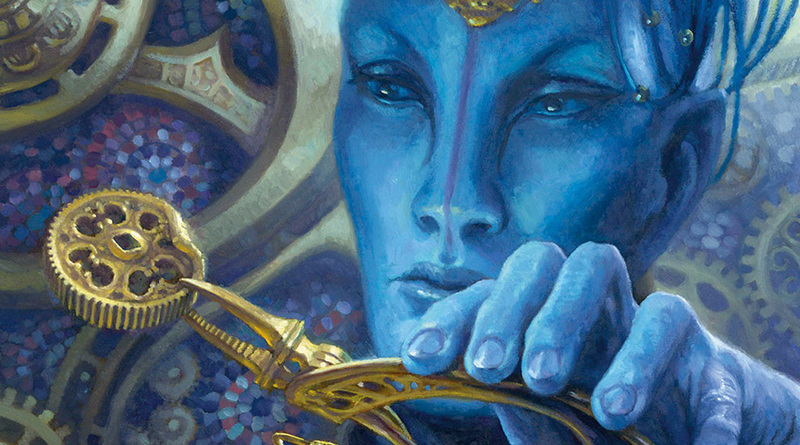 Recognizing that Tezzeret's presence on Kaladesh might indicate a planar—or even interplanar—threat, Liliana heads back to alert the rest of the Gatewatch. But Chandra is too impatient to wait; she has to save her mother. She looks to an old family friend, Oviya Pashiri, for help. Mrs. Pashiri leads Chandra and Nissa to the Dhund, a secret Consulate compound where she suspects Pia is locked away. But when they arrive, they are cornered by Baral, the Consulate captain who killed Chandra's father and attempted to execute Chandra. He's seeking revenge for the way things ended last time, when Chandra escaped and left him terribly burned. He traps the would-be rescuers in a cell that rapidly fills with poison. Chandra and Nissa don't want to planeswalk away and leave Mrs. Pashiri to die, but they fear they have no other choice. 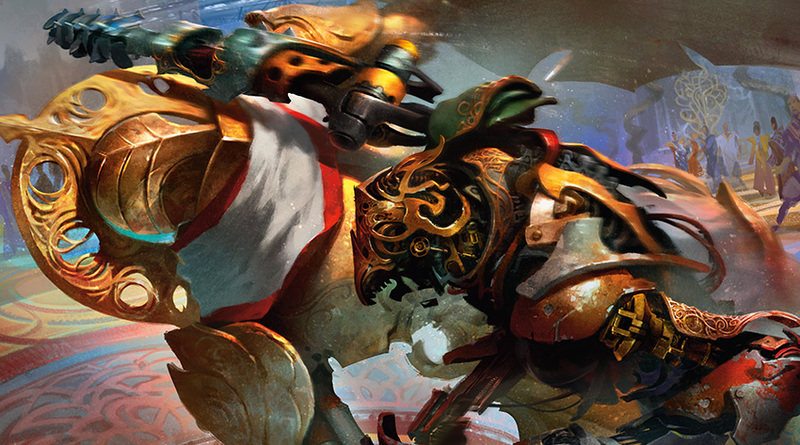 Then suddenly, the door to the cell flies open, and in storms a leonin warrior come to rescue them: Ajani Goldmane. After their escape, Chandra and Nissa meet up with the rest of the Gatewatch. They hear that Tezzeret is planning to challenge Pia Nalaar to a duel at the Grand Exhibition at the end of the Fair. That will be their chance to rescue Pia. Though they try to keep a low profile at the Grand Exhibition, none of them can stop Chandra from running into the arena when Tezzeret threatens Pia. The others support Chandra as she uses her pyromancy to battle the manic metal mage. Just when they think they have Tezzeret cornered, he slips away. The other Planeswalkers are furious that they lost him, but Chandra doesn't care. Her mother is safe. It's not until they leave the arena that the Gatewatch realize the dramatic showdown was all part of Tezzeret's scheme. 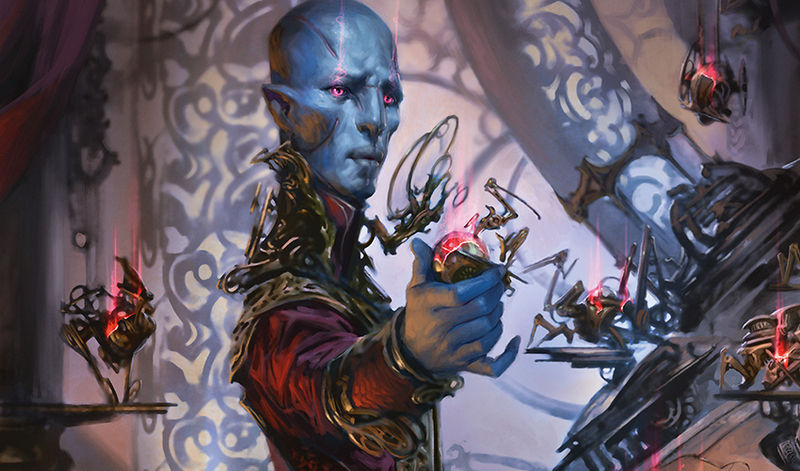 While everyone's attention was on the Grand Exhibition, Tezzeret's accomplices in the Consulate confiscated all the wondrous inventions at the Fair. Now Tezzeret has locked himself away with his spoils to begin constructing some kind of device—one that the Gatewatch are convinced will be just as nefarious as the mage himself. Their work here is far from done. They have a new target now, and they refuse to let Tezzeret dupe them again.